WOAH! Coconut sugar. caramelized. poured over nuts. 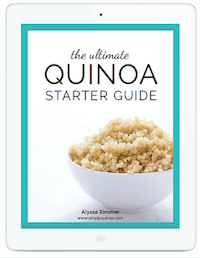 with quinoa. turned into candy. Yep, I'm pretty much in heaven right about now. This is a total first for me. Making candy. I've never even attempted it. I mean just the idea of making candy kind of terrifies me. I'd so much rather eat a plate of fresh baked cookies. Way safer. BUT as it turns out, this whole caramel thing isn't hard at all! 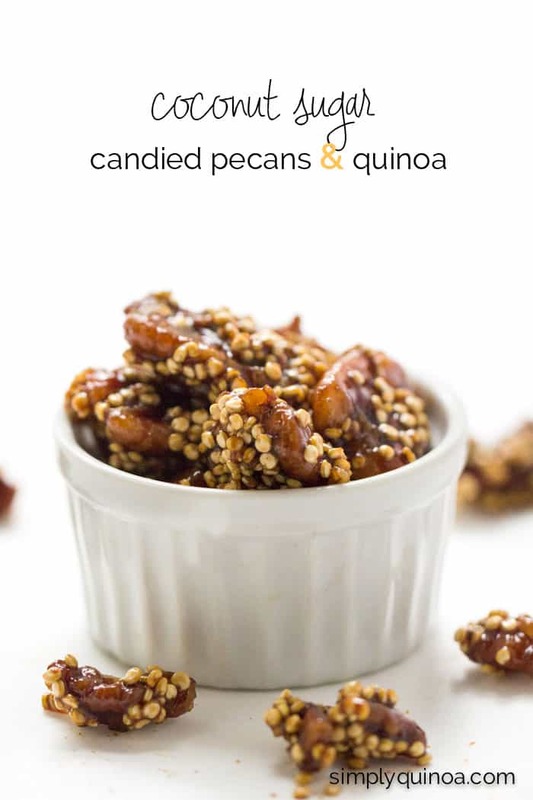 And so here we have it, my first candy recipe: coconut sugar candied pecans and quinoa. Pecans might just be one of my favorite nuts. I love how the bridge the gap between sweet and savory. They've got that wonderful caramel like flavor, they're soft and almost buttery. Homemade pecan butter has actually been a staple in my house for months now – it's like eating a spoonful of pie! So candied pecans. Of course, anything coated in a thick layer of caramel is going to be delicious, but traditional caramel ingredients? Not my cup of tea if you know what I mean. Sugar. sugar. and more sugar. Coconut sugar on the other hand. Much more my speed. As I'm sure you've noticed, coconut sugar is the sugar I turn to whenever I need to use granulated sugar. 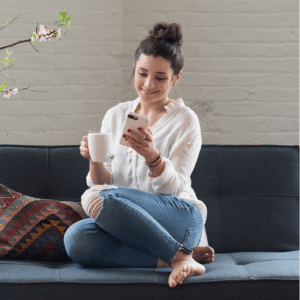 I love the flavor, I love the caramel undertones and I love that it's a low-glycemic sweetener. That means less blood sugar spikes, which means metabolism stays more on track and you don't fall into that dreaded sugar coma. 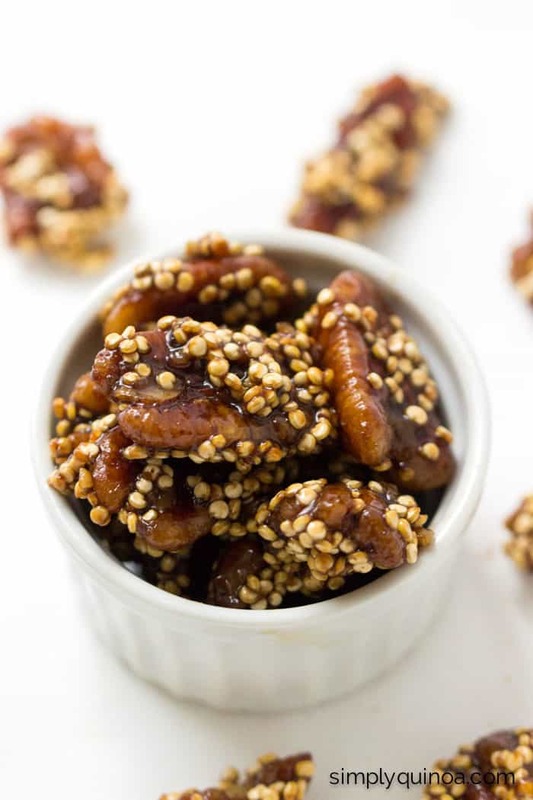 This recipe actually started off as just a garnish to a recipe that I'm sharing on Tuesday, but since there is a lot to tell you about these wonderful little morsels of joy, I wanted to give them their own time in the spotlight. 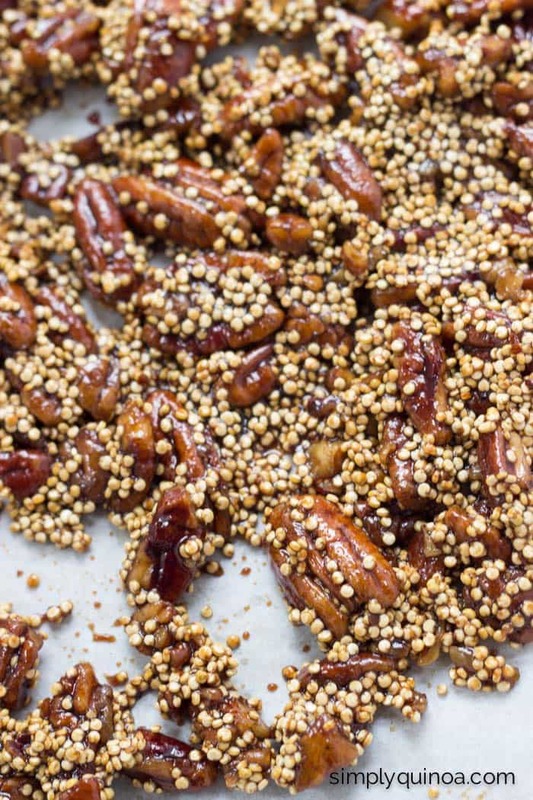 I mean they are candied pecans with quinoa after all. 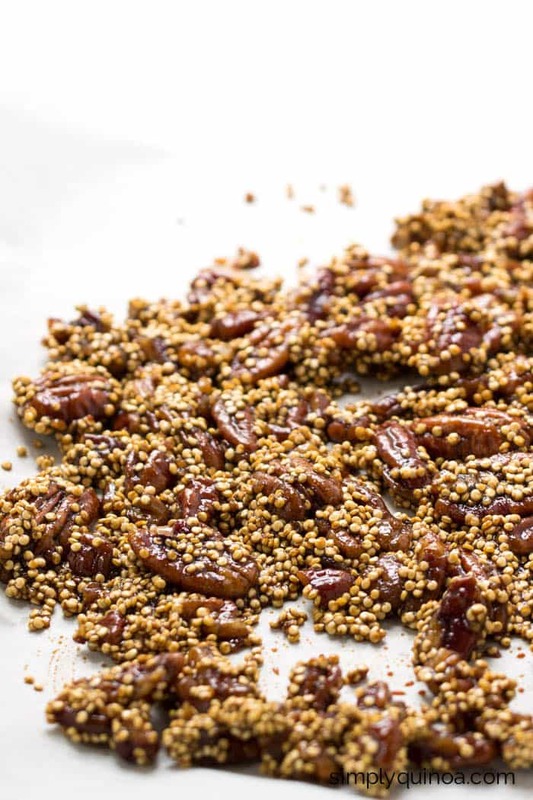 If you've never made candied nuts before, and I certainly had NOT, it starts by making caramel. The caramel is usually just sugar and water boiled down to form a candy. Then it's poured over the nuts and left to harden. Almost like making brittle but without the corn syrup. 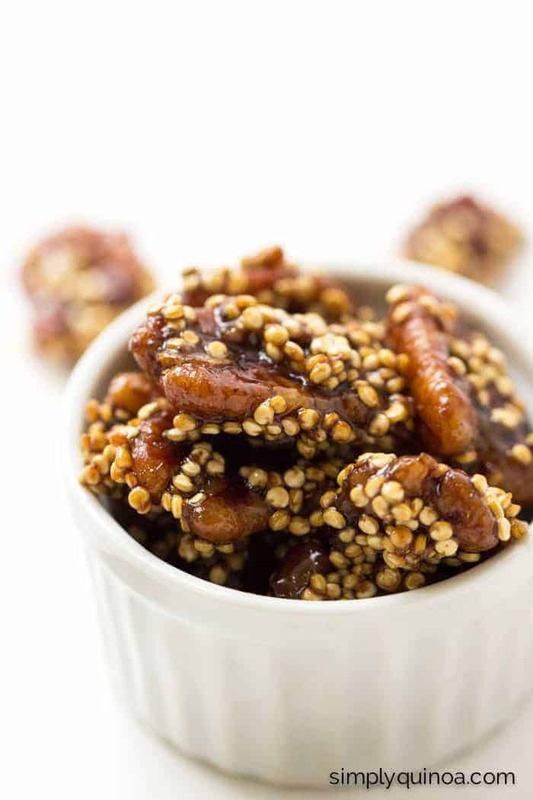 But I wanted these candied nuts to use coconut sugar. Is that even possible? Coconut sugar is different than cane sugar though, and I honestly had no idea if it could be caramelized. 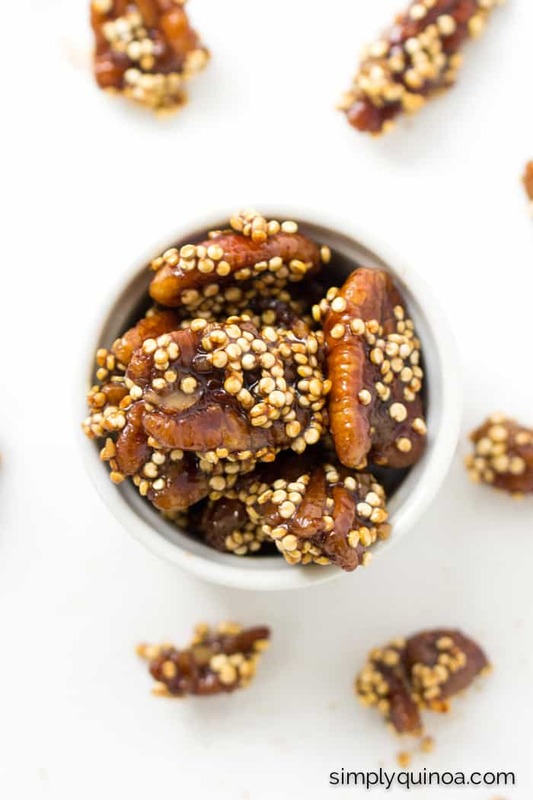 I did a little searching and thankfully landed on a trustworthy blog (that I've loved for a long time) that talks all about making caramel with coconut sugar! It seemed fairly straightforward so I gave it a whirl and guys, it TOTALLY worked!! Sweet, crunchy, dark and ultra decadent. 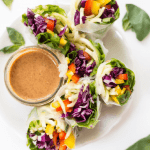 These delectable little bites are also good for you! That's right. 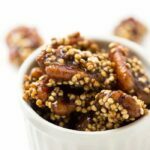 Now we can have healthy candied nuts (with quinoa if you so choose) to sprinkle over salads, enjoy as a late night treat or to have around for the holidays! Ready to get your candy on? Let's do this! Add the coconut sugar, water and salt to a small saucepan. Bring to a boil, then reduce to simmer. Stir until the sugar has dissolved and then add the pecans. Stir the mixture constantly until the liquid evaporates and the nuts becomes sticky. Add the quinoa and continue to stir until cobwebs (stringy pieces of sugar) begin to form. 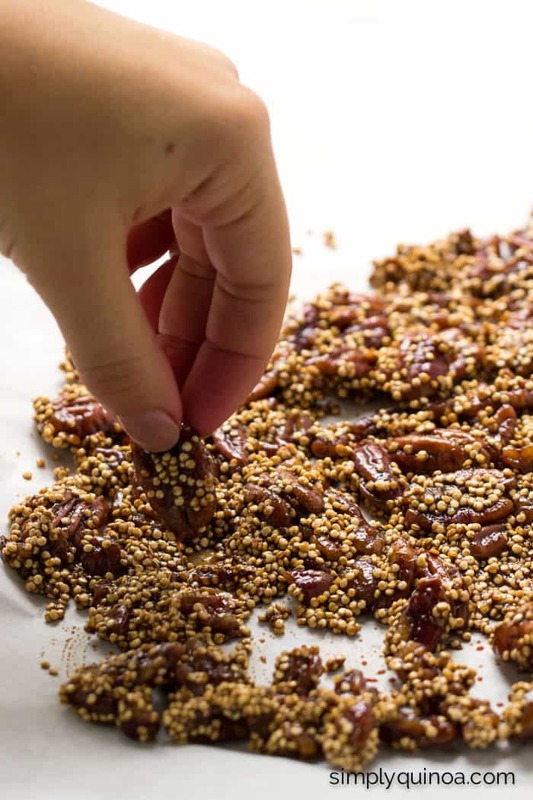 Remove from the heat and pour nuts onto a parchment lined baking sheet. Cool at room temp (or in the fridge) until they've hardened. 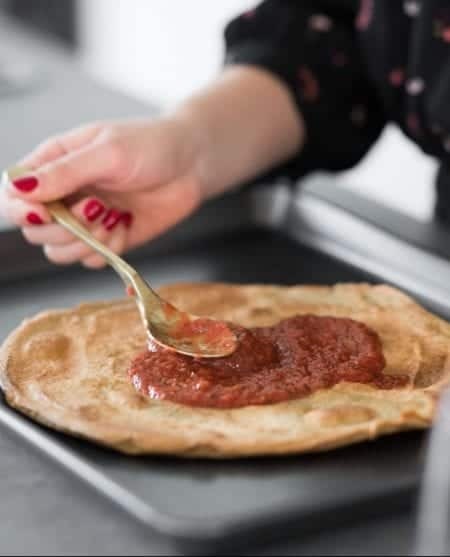 As Lexie points out in her post, coconut sugar has a low burn point so it's important to watch it carefully so it doesn't burn. I found these kept best in the fridge! I make something similar with cayenne pepper to give it a little kick as well as cumin. Do you mean add the water, sugar, and salt? yep, sure did 🙂 Thanks for that! 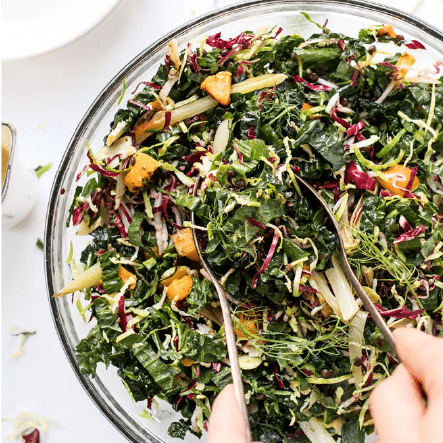 oh this looks SO good . . . . going to HAVE to do this! !